Get Double the Mileage and Double the Track! – Introducing HOOPLA TOY'S Double Sided Play Mat… The mat that gives your little one options, and makes play time even more exciting! Introducing the Double Sided Play Mat from HOOPLA TOYS! With double the action and adventure it’s everything your little ones need for hours of creative and educational fun! Featuring two sides chock-full of roads, railroad tracks, city landscapes, buildings, and houses you get a creative and wholesome way to inspire your little movers and shakers! Perfect for daycares, schools, churches, or your home. 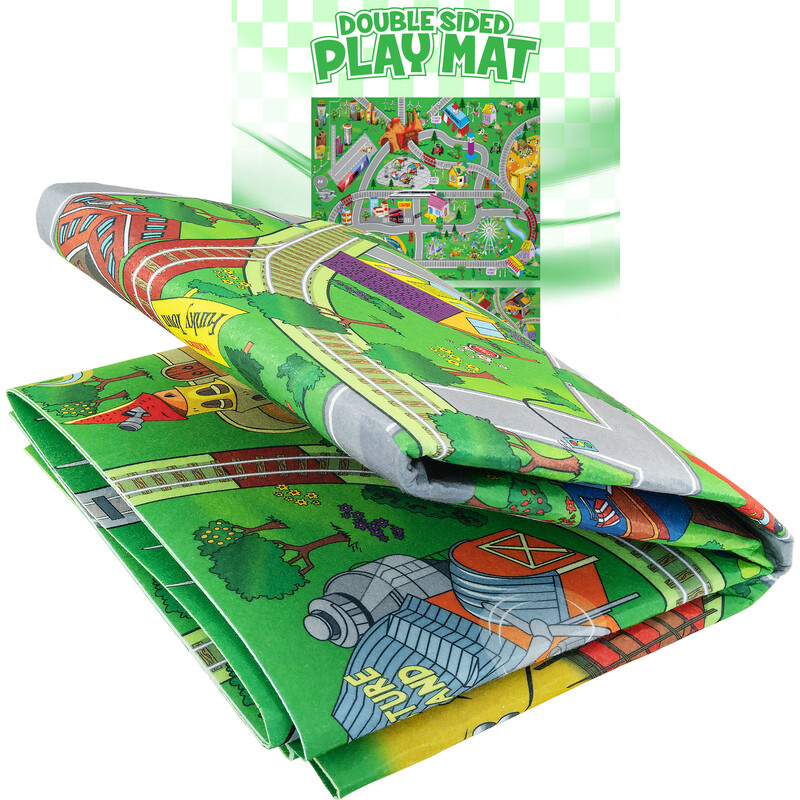 This mat goes great with all your toy cars, wooden trains, building block creations, and so much more! Your tot gets hours of fun as they explore two sides of detailed and whimsical artwork, that brings the city to life, helps them learn all about public infrastructure and have a little good old fashioned play time too. At 59" x 48” you’ve got plenty of room for everyone! Perfect for groups and play dates, and ultra-fun for a master builder! Looking for the perfect gift? – Look no further. Tots and bumpkins everywhere love the realism and the imagination of the model city. It’s a modern classic! Grab Yours Today! From infants, all the way to big kids… Our mats get some serious “mileage!” Full color mat is printed on both sides. Mat is 0.07" in thickness. It is fold-able for storage when not in use.